A fine piece of teamwork in SA put the Les Walkden Rallying (LWR)-prepared All-Wheel Drive Subaru WRX STI well and truly back in contention in the CAMS Australian Rally Championship, going into the final round at Coffs Harbour, NSW; which is also the 13th and final round of the 2018 World Rally Championship. Subaru do Motorsport driver Molly Taylor is currently placed fourth in the Championship, on 260 points, in the turbocharged Production Rally Car (PRC)-class WRX STI. But only 22 points separate her from second-place Harry Bates in the Toyota Yaris AP4. Adding to the excitement, third-place Steve Glenney is just 13 points ahead of Taylor. While championship leader Eli Evans on 338 points in the Fabia R5, may seem unbeatable, history shows the endurance nature of Rally Australia over three days can on occasion turn it into a lottery for highly competitive contenders. Molly – who took out the 2016 ARC title at Coffs Harbour – and co-driver Malcom Read, say the team's never give up attitude have made it a strong contender to pressure for points across the three gruelling days in the forests inland. Molly said: "We're going to fight hard because there's still every chance of us grabbing some championship honours. "Realistically, Eli is in the box seat, but timewise this is the longest rally in our domestic championship, and as we've seen throughout the series, it can produce a lot of attrition, so everything is up for grabs right across the top four teams. "We'll be focusing on our own performance rather than what the others are doing – that way we know we've got every chance of producing something special. "Coming off the back of Tasmania and South Australia, we know this car is capable, we know everyone on the team is primed to achieve the best we can, so let's get going. "Plus, Malcolm is third in the co-driver's championship, so it's in his interests to get us through as quickly and efficiently as we can!" Molly's "down time" between rallies included participating in the 82 km charity MS Gong Ride, from Sydney-Wollongong, as part of Subaru Australia distributor Inchcape Australia's One Inchcape team. She also visited the Northern Territory, with the "Get Your Mob There Safely" program, delivering a safe driving message to remote and Indigenous communities. Subaru partnered with Life Education NT and Healthy Harold, following a grant awarded to Life Education NT as part of the Towards Zero Road Safety Grants program. 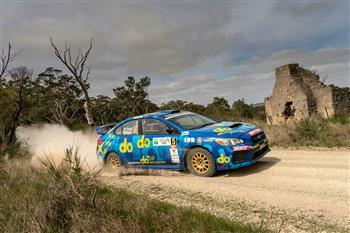 Rally Australia is the sixth and final round of the 2018 Championship. Friday's Leg 1 covers eight competitive stages over 101.68 competitive kilometres. The big endurance test is Saturday, with 10 stages over 133.0 km, including the rally's two longest, the 28.83 km Welsh Creek Reverse I & II. The rally wraps on Sunday with six more stages over 83.96 km.